Pommard is as picturesque as a place can get. It’s also the place we call home. As the four seasons come and go, and the scenery of this small village transforms in color and tone, from green to red to brown, vibrant vitality to cozy tranquility, there are many amazing things that make this beautiful, breath-taking location stand head and shoulders above the rest. Pommard is the perfect place to fall in love with life all year round. But, right now, in August, Pommard is alive with life, people, food, music and wine. It’s party time because Summer is here. And so should you be. 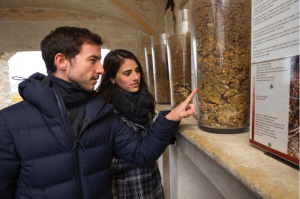 Our six wine experiences are alive and kicking with expert wine education and the best way to discover Burgundy as you’ve never seen it before. 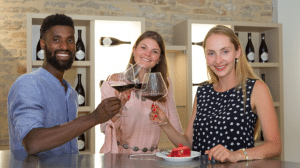 These brand new experiences are custom-made to suit the subtle and separate tastes of every Burgundy wine lover, from curious first timers to Côte d’Or connoisseurs. Climats – Discover the UNESCO World Heritage Protected climats of Burgundy and their Exceptional Universal Value. 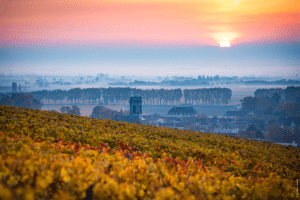 Pinot Noir – Unearth the truth about Burgundy’s noble grape, at home in its birthplace. Chardonnay – Explore the origins of Burgundy’s white wine and why here, above anywhere else on earth, this grape grows best. Sommelier – Test your Wine IQ to its limits with this immersive and informative Wine Experience. Vendanges – Harvest is just around the corner this September, so reserve your spot now for an unforgettable day in the vines of Clos Marey-Monge. A once-in-a-lifetime experience? Absolutely. Jeunesse – In need of a fun family day out? Children aged 5-17 will fall in love with our tailored-made Experience just for kids. For more information on all our Wine Experiences, head on over to here! 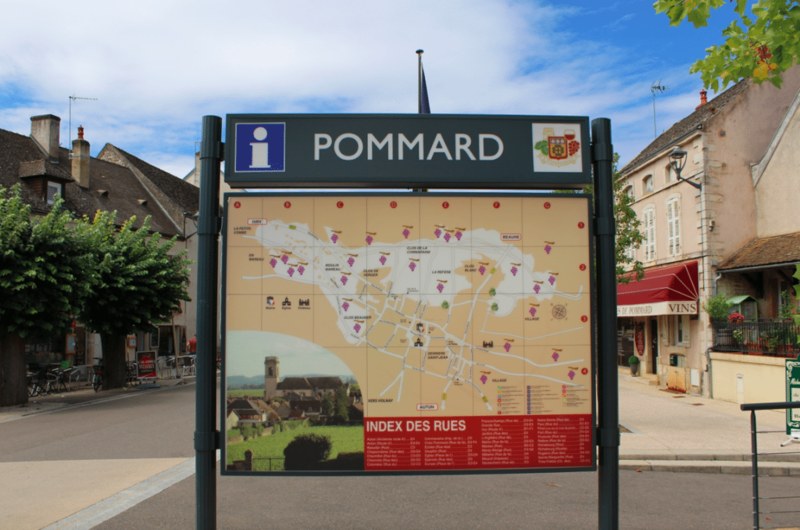 Pommard is home to 60 winemaking domaines. Château de Pommard is the largest, and the oldest, with its roots reaching back to 1726. The estate is also the only monopole for miles away and has been cherished for decades as the home to seven distinct terroir – including the great Simone parcel, a true Burgundian curiosity. With more than 185 producers making Pommard wine throughout the Côte d’Or, this 320-hectare village is a great place to stretch your legs as well as expand your wine IQ. 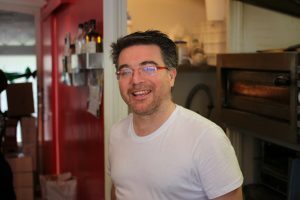 Just off the village’s central junction you’ll find our favorite pizzeria – Calabria. This intimate and cozy pizza parlour is perfect for relaxing outside in the shade, watching twilight take control and sipping a glass of whatever takes your fancy. 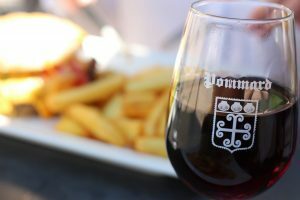 The Château de Pommard team can often be found here, sipping on a cold beer and scoffing a fantastic fresh pizza made to order by our dear friend, Lucien. 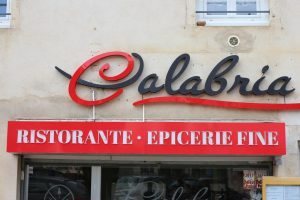 Great pizza in Burgundy is rare, so we count ourselves lucky that Calabria is just down the road. For more information on Calabria, head on over to here! On a hot Summer’s day, sometimes you need more than a glass of refreshing Chardonnay to hit the spot. Sometimes only an ice cream will do. 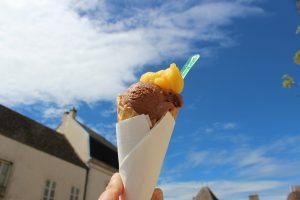 One of the Côte de Beaune’s best chocolatiers and ice cream houses sits in the sweet spot of the village’s center and serves the best chocolate ice cream and treats you’ve ever tasted. If we’re not hard at work at the Château, this is the place to find us. 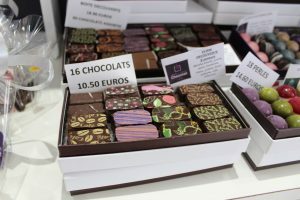 For more information on Appellation Chocolat, head on over to here! 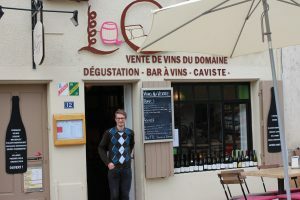 A Burgundy legend, La Cie Fanny is Pommard’s coolest wine bar and eatery. 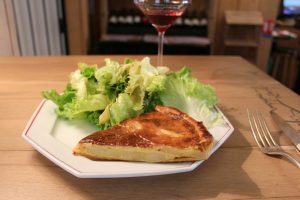 It’s also home to the famous, and ultra-delicious, Epoisses Tart and Fanny Sabre Wine, made by the owner Fanny Sabre, and poured with generous amounts of geniality and TLC by good friend, Sébastien. If you go, say hello from us. For more information on La Cie Fanny, head on over to here! 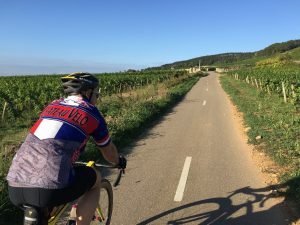 Running right behind Clos Marey-Monge, and straight through the heart of Pommard, the Route des Grands Crus is Burgundy’s famous wine road, the path that connects and unites all the appellations of the Côte d’Or. Celebrating it’s 80th birthday throughout the whole of 2017, there’s no better month than August to grab your bike, your mates, and take a spin down this cherished 60-kilometre stretch of countryside. For more information on the Route des Grands Crus, head on over to here! Straddling the south-trickling Dheune stream, Pommard’s most popular Summer restaurant, Hotel du Pont, has a menu and reputation that travellers from far and wide come to seek out. 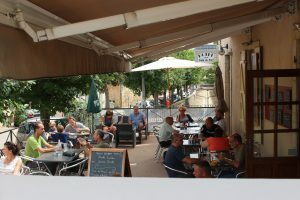 It also has a steak option to die for, the perfect feast for those working up a sweat cycling the Route des Grands Crus and for those working up a big appetite walking through the nearby vineyards. For more information about Hotel du Pont, head on over to here! 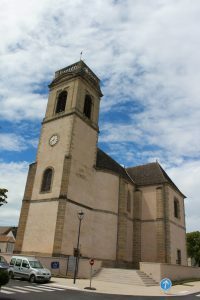 In 1794, Pommard’s awe-inspiring church, located in the center of the village, opposite the Mayor’s office, was burned to the ground by heretics. 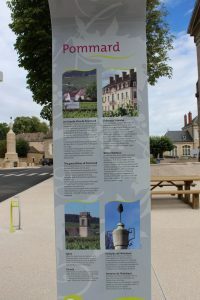 Much of the Micault family history, the first family of Pommard, and the founders of Château de Pommard in 1726, was lost. Today, the church is resurrected to its former glory and is the foundation of life and society in the village. 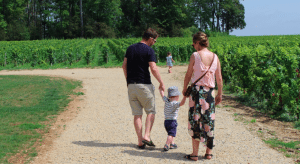 Enjoying a leisurely meander through a vineyard is any Burgundian’s favorite way to while away spare time. Vineyards are a great place to disconnect and let your mind wonder as your feet do all the hard work and the wandering. 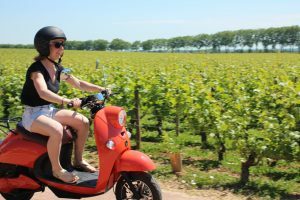 While the sun’s shining in all its Summer finest, today and tomorrow, and until the end of September, is the best time to touch, feel and taste the terrain and terroir that makes Burgundy the envy of the wine world. Clos Marey-Monge, Château de Pommard’s 20-hectare monopole vineyard, is a great place to get lost in…and found. The ocean of 200,000 green vines enclosed within our famous 6,000ft-long wall… A sight to behold and treasure forever, especially if seen from the “montagnes of Pommard”, the gently elevated golden slopes to the west that offer a picture-perfect panorama of Pommard. For those who like to wake up with the birds, a sunset view of Clos Marey-Monge is a view your eyes will forever thank you for, as pictured below. Pommard from above is as spectacular as those words suggest. Hot Air Balloon adventure rides over the vineyards of Burgundy are incredibly popular during Summer, the only months that operators around Beaune schedule flights. For those that want to get a bewitching bird’s eye perspective of the mosaic of climats, as well as the hills of the Côte d’Or, then this is your golden ticket. Reservations are required. In August 2017, we sent a Phantom DJI Drone around Clos Marey-Monge to simulate what a Hot Air Balloon ride over Clos Marey-Monge looks like. The results are spectacular! For more information on Ballooning over Beaune, and the surrounding appellations, head on over to here! This inspiring video about life as a winemaker in Pommard should ensure your bags are swiftly packed. Forever. See you soon and enjoy the view.